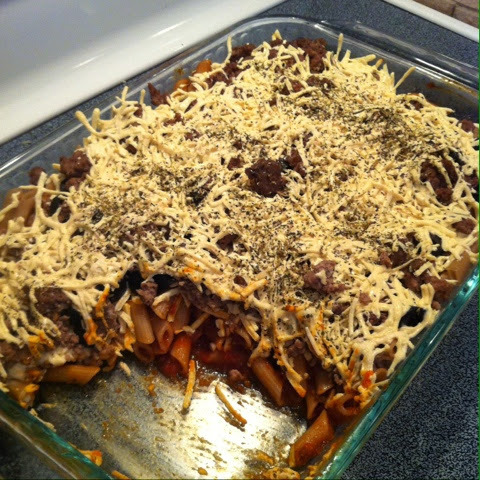 One of my all time favorite casseroles is pizza casserole. I used to make it all the time before we had kids. But it has been several years since I have made this due to the multiple allergies in our house. We are currently living in a small townhome while we are having our new home built. It will be several months before we can live spaciously again, and I have been frustrated with our current kitchen set up. This frustration has blocked my creativity in the kitchen. We have been eating a lot of boring, simple meals. Bubs asked if we could have the taco casserole I used to make (recipe to come), and that got me thinking. Pizza casserole is so easy to make, and it can easily be adapted to meet my family's special diet needs. It turned out great, and all four kids loved it! Saute onion in 1 1/2 tsp butter until brown. Toss warm noodles in remainder of butter (2 Tbsp) in a 9x13 dish until melted. Cover noodles with pizza sauce. Add half the cheese and pizza toppings (meat, peppers, olives, etc). Add onions. Sprinkle with oregano and basil. Top with remaining cheese. Bake at 350º for 20-25 minutes.